An exciting and undoubtedly progressive new focus will dominate this year’s International Automobile Exhibition (IAA) in Frankfurt, Germany. Running for more than a week and occupying more than 12 buildings, this is the crème de la crème of all auto shows in the world. Previous exhibitions were preoccupied with lowering fuel consumption, reducing carbon emissions, etc. But this year, the IAA is all about cars becoming smarter and safer as mobile communication platforms, and perhaps more importantly, as electric mobile communication platforms. Matthias Wissmann, president of the German Association of the Automotive Industry, seemed almost giddy as he addressed the media on Monday, September 9th – the first press day of the exhibition. However, as Wissmann boasted about the German auto industry’s milestones, he clearly noted that there was no room or time for complacency. Thus far, the triumphs have been in optimizing the old and tired combustion engine technology by either turbocharging or utilizinglighter car bodies, smaller engine capacities or fewer cylinders. In other words, everything that can be done with diesel and petrol engines has been done, and furthermore, meeting the 95 gram CO2 target planned for 2020 is only possible if electric cars are widely accessible and embraced by consumers in large quantity. Electric and connected cars are no longer the stuff of science fiction. 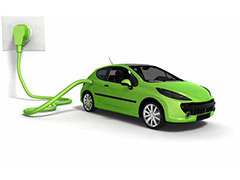 They already exist in small pockets and several forms including pure battery, plug-in hybrids, and fuel-cell vehicles. The technology doesn’t have to leap that much further to become viable. In fact, German manufacturers alone will launch 16 series models with electric drive onto the market by the end of 2014. Posted on September 17th under Renewable Electricity.